The flushing of nondispersible wipes has become the biggest problem for collection systems operators over the past few years, and it’s only getting worse. Kevin Bates of JWC Environmental discusses the issue and offers potential solutions. The following is an excerpt of Bates’ conversation with Water Online Radio. 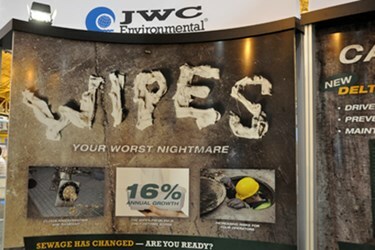 Water Online Radio: Someone that’s outside of the industry probably would be very, very surprised that the most highly trafficked topic on Water Online is flushable wipes. Give us an education. Sewage has changed in the last couple of years. These wipes have come on to the market and they’re really creating havoc in the collection systems. Another thing is that [the wipes market] is forecasted to be double in the next five years, so it’s just going to get worse unfortunately if we do something about it. Water Online Radio: I want to be sure that the audience hears this. Where are most of these problems showing up? Kevin: Collection systems are number one. I mean it’s coming down and creating clogs as they’re trying to get it lifted and moved on to the plant. So that’s number one. But also, once it gets to the plants, if they’re not getting it out of the headworks, if they don’t have the right screening technology in place, we’re seeing people fouling it all the way through the system. It’s binding pumps, it’s binding valves, it’s getting into check valves, it’s creating a lot of havoc all the way through the system. Water Online Radio: Okay. What do we do? Let’s talk about the solution to some of this. Hear the solution by clicking on the Radio Player link below.